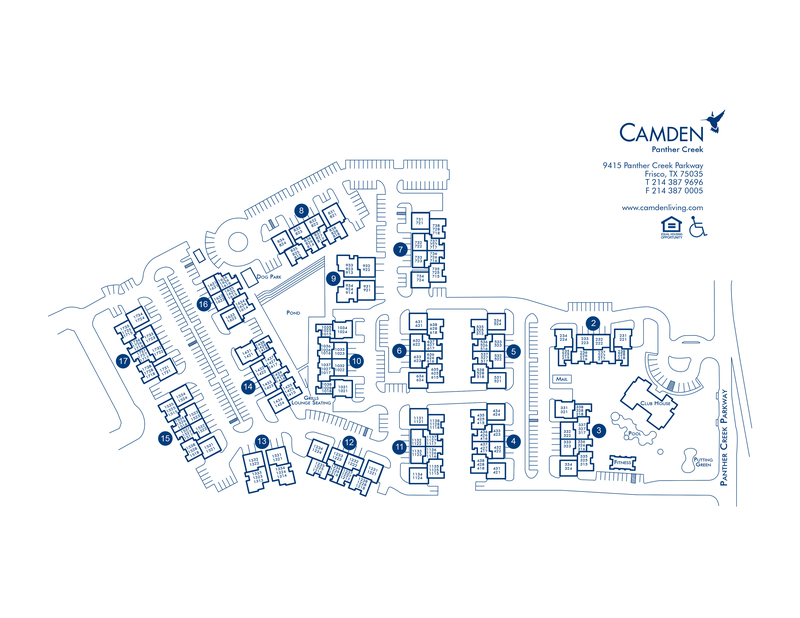 Camden Panther Creek offers one, two and three bedroom apartment homes located just minutes from Dallas North Tollway in Frisco, TX and in the acclaimed Frisco Independent School District. Our apartment homes are perfect for those seeking a quiet, resort-style retreat from the city life! Camden Panther Creek apartments offer many features like granite countertops, oversized windows, a private patio/balcony, walk-in closets, designer lighting, maple cabinetry and a washer and dryer. Most apartments also include additional amenities like a private garage, kitchen island, walk-in shower, and hardwood-style flooring - just to name a few! Come home and enjoy the many other resort-style perks that Camden Panther Creek has to offer. Get a full body workout at our 24-hour Fitness Center with free weights and cardio equiptment. Test your skills at our resident Social Lounge with Xbox 360, Wii, a pool table, a poker table and flat screen TVs. Enjoy relaxing outdoor retreats and lounge in an oversized hammock next to our spectacular, resort-style pool. Host your friends and family at our poolside Grilling Lounge or Social Lounge, both complete with WiFi. Your furry friends will love it here too! Our private dog park is the perfect place to hang out and play while enjoying the scenic views. Camden Panther Creek is serene, but not secluded – we are mere minutes from upscale shopping and popular dining at The Shops at Legacy, Stonebriar Centre and The Shops at Willow Bend. Toyota Stadium, Dr. Pepper Ballpark and Frisco Square are all within your reach. Or check out Frontier Park in Prosper or the Dallas Cowboys Training Facility at The Star in Frisco, just a short drive away. Make relaxation part of your daily life at Camden Panther Creek! At Camden, your pets are family too! We welcome cats and dogs, up to two pets per apartment home, with a full-grown maximum weight limit of fifty pounds each. Call us with any pet-related questions! Get the perfect spot! We have ample open parking for our residents with a permit and for visitors in designated areas on a first-come, first-served basis. All 1st-floor apartment homes come with an attached garage. Detached garages are available to rent for $100 per month. Carports are available for $20-$30 per month and select apartment homes have assigned carports.